Downstairs Restaurant is located on the lower ground floor of Gilbert & Wright Bar in Clontarf , on the old Howth road. As the name suggest, it is in a basement but this is no ordinary basement; Think more along the line of a sous sol adaptation of a New York loft. The interior features a two tiered dining area, the front, with impressive high ceilings has large windows, allowing natural light to flood the space.Dark oak wooded flooring, silver studded oak tables, elephant grey walls, low-slung leather banquettes and mixed seating upholstered in jazzy prints. creates a relaxed space for dining, drinking and socialising. With Head Chef Brian Walsh,who has previously worked in Mint and Patrick Guilbaud, both Michelin * establishments, it is no surprise that the restaurant was awarded a Bib Gourmand in 2012 from Michelin Guide and has retained it ever since and well deserved it is too . We are here for Sunday lunch;While offering more innovative dishes and remaining price competitive for the "A la carte menu, " Brian Walsh has ensured that the dish selection for lunch is inventive, together with their Steak night on Monday & Tuesday, when you can avail of a 10 oz prime Irish striploin, flat capped mushrooms, caramelised onions, skinny fries, pepper sauce or roast garlic butter and a draught beer or a glass of house wine for only €19.95. A bargain but all this has obviously kept a steady flow of loyal customers, as the place was buzzy. For Starters, the clean and fresh sounding of Crispy Ham Hock, crubeen with granny smith apple @ €8.95, was very appealing as did the Goat Cheese Pannacotta with pumpkin & pecans @ €7.95. It was elegantly presented , the dark plate off-setting the slab of terrine to it's full advantage. Candied figs, black figs, curled shavings of cornichons and nasturium leaves dotted the plate along some fig jam & chutney. Generous pieces of tender rabbit flesh was layered and sparingly pressed within was crumbled black pudding, while the foie gras kept it very moist. 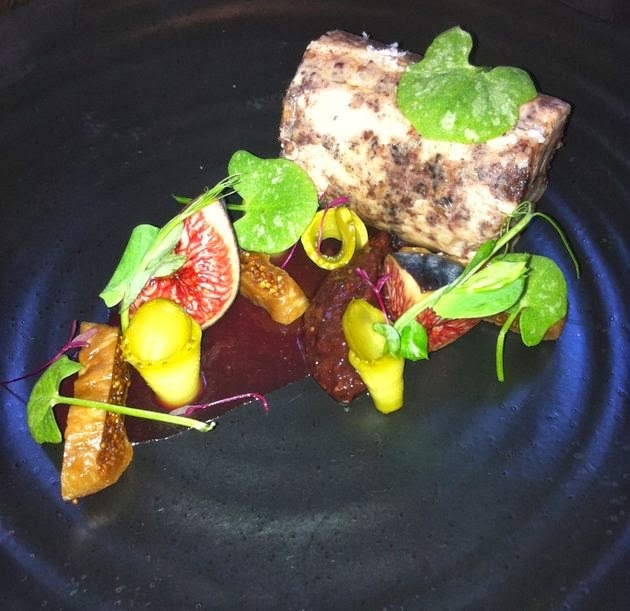 The combination of flavours in this colourful dish worked well together and the whole ensemble was rounded off with the sweetness of the various figs textures and the sharpness of the pickled cornichons. A great starter. For one of the mains, we chose "The roast of the day," @ €14.95, Roasted Duck leg, sprouting broccoli, kale, crush root vegetables, mash & parsnip pureé. A very thin and crispy duck skin sat atop a very succulent duck leg, the skin having been baked separately between two oven trays. 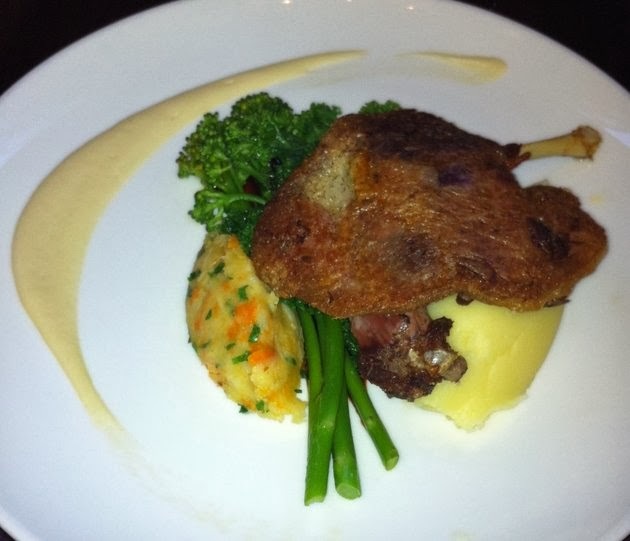 The rich flavours of the duck contrasting nicely with the silky and creamy mash potatoes and crispy duck skin, while the crushed root vegetables , with it's slight smokiness, added texture as did the sprouting broccoli . A simple enough dish but put together very well. Delicious and made you realise that this is what Sunday is all about ! 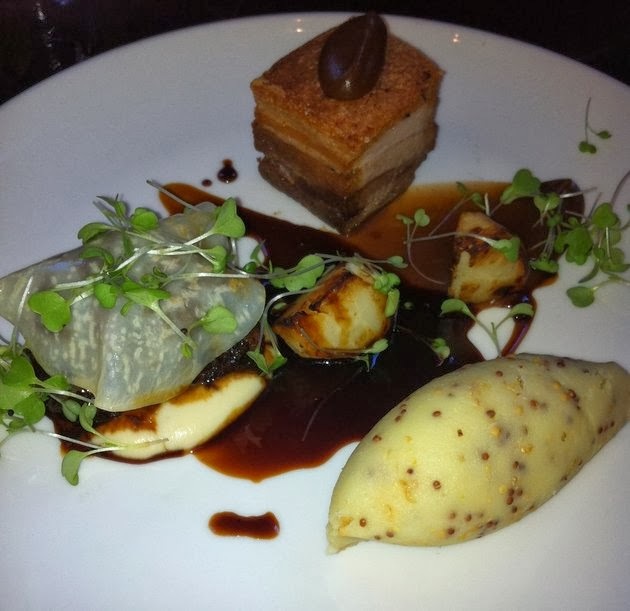 The other main of Braised Pork, celeriac,balsamic apple & wholegrain mustard mash @€17.95. Again the crispy exterior of the pork belly gave way to some very tender meat and the skin was almost like candied bacon. The treacly taste was equally offset by the very tasty wholegrain mustard mash. A smooth celeriac pureé , wafer thin tranche of pickled celeriac, balsamic apples and flavourful red wine glaze completed this glorious dish. It was beautifully presented and looked like it was lovingly crafted in a Michelin * kitchen. And this wasn't style over taste either. 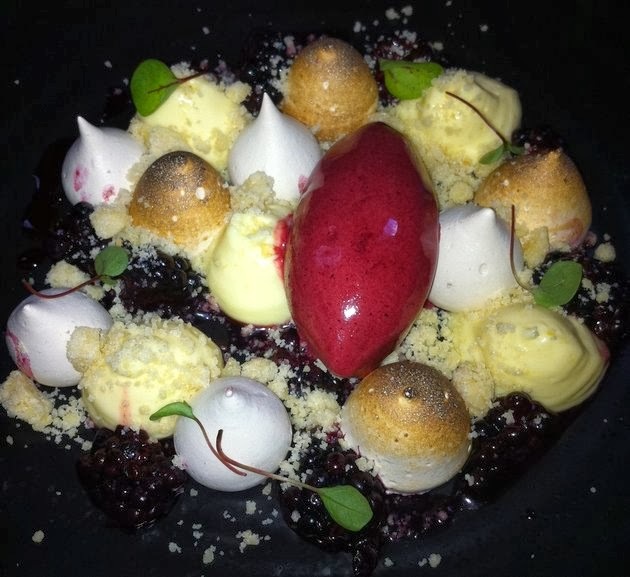 It was Divine, A soft caramelised crust on some of the meringues, gave way to marshmallowi'sh interiors, which went down well with the tart blackberry sorbet, while the feathery light lemon mousse complimented the other crisp meringues and the sablé biscuits. It was a sumptuous end to a very satisfying lunch. Brian Walsh is without doubt a very talented Chef and I like his quirky, contemporary approach to cooking. It was a great combination of authentic bistro style dishes but with an adventurous push towards fine dinning. And he did it superbly well. I highly recommend you to visit Downstairs Restaurant. It is the perfect place to will away the hours on a lazy Sunday afternoon, over a long and relaxed lunch with glorious food and at such amazing value,you would be foolish not too.